Journal of Computational Physics has an open access mirror journal Journal of Computational Physics: X, sharing the same aims and scope, editorial team, submission system and rigorous peer review. 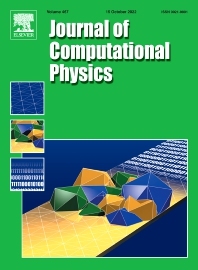 The Journal of Computational Physics focuses on the computational aspects of physical problems. JCP encourages original scientific contributions in advanced mathematical and numerical modeling reflecting a combination of concepts, methods and principles which are often interdisciplinary in nature and span several areas of physics, mechanics, applied mathematics, statistics, applied geometry, computer science, chemistry and other scientific disciplines as well: the Journal's editors seek to emphasize methods that cross disciplinary boundaries. The Journal of Computational Physics also publishes short notes of 4 pages or less (including figures, tables, and references but excluding title pages). Letters to the Editor commenting on articles already published in this Journal will also be considered. Neither notes nor letters should have an abstract. Review articles providing a survey of particular fields are particularly encouraged. Full text articles have a recommended length of 35 pages. In order to estimate the page limit, please use our template. Published conference papers are welcome provided the submitted manuscript is a significant enhancement of the conference paper with substantial additions. Reproducibility, that is the ability to reproduce results obtained by others, is a core principle of the scientific method. As the impact of and knowledge discovery enabled by computational science and engineering continues to increase, it is imperative that reproducibility becomes a natural part of these activities. The journal strongly encourages authors to make available all software or data that would allow published results to be reproduced and that every effort is made to include sufficient information in manuscripts to enable this. This should not only include information used for setup but also details on post-processing to recover published results. You can link to data posted in a repository or upload them to Mendeley Data. We also encourage authors to submit research elements describing their data to Data in Brief and software to Software X. Please see our Guide for Authors for information on article submission.